Seattle Children's Hospital and Research Institute, Seattle, Washington. Children's Hospital of Los Angeles, Los Angeles, California. University of Washington School of Medicine, Seattle, Washington. Diagram of experimental procedures and testing conditions with each of the ventilator's volume-targeted modes. IM = intramuscular. 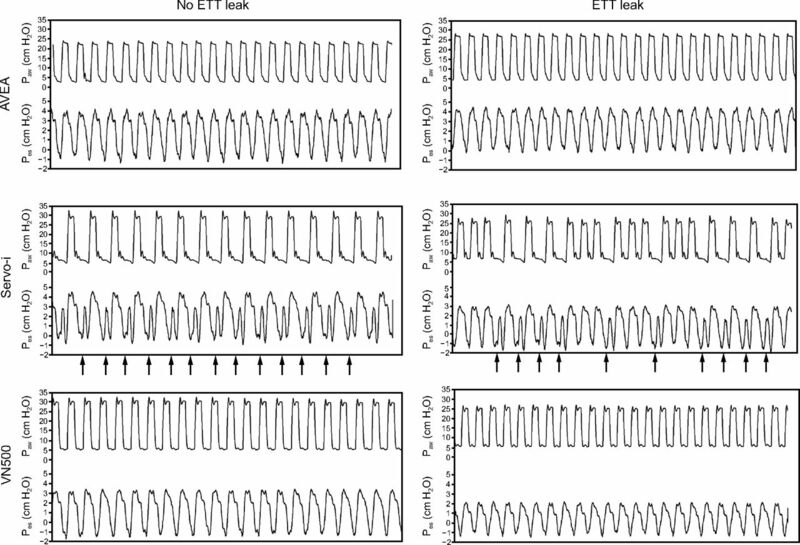 Effect of each ventilator's volume-targeted mode with and without ETT leak on gas exchange: PaO2 (A), pH (B), and PaCO2 (C). Data are presented as mean ± SD. 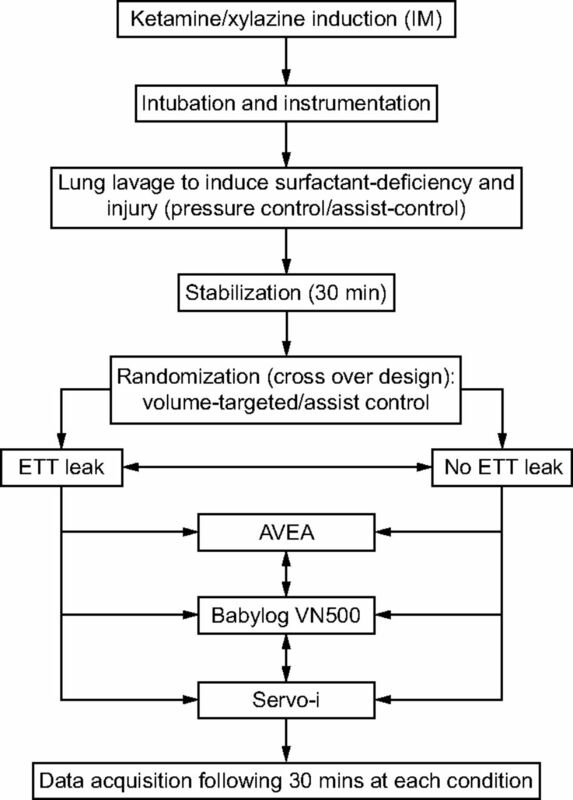 Linear-mixed effects models were used to evaluate the association of ventilator and leak status on each continuous outcome variable with ventilator type and leak status treated as fixed effects; P < .05 was considered significant: *P < .05 between the AVEA and Babylog VN500 within leak and no leak conditions; †P < .05 between the AVEA and Servo-i within leak and no leak conditions; ‡P < .05 between the Babylog VN500 and Servo-i within leak and no leak conditions; **P < .05 between leak and no leak conditions within the ventilator brand. 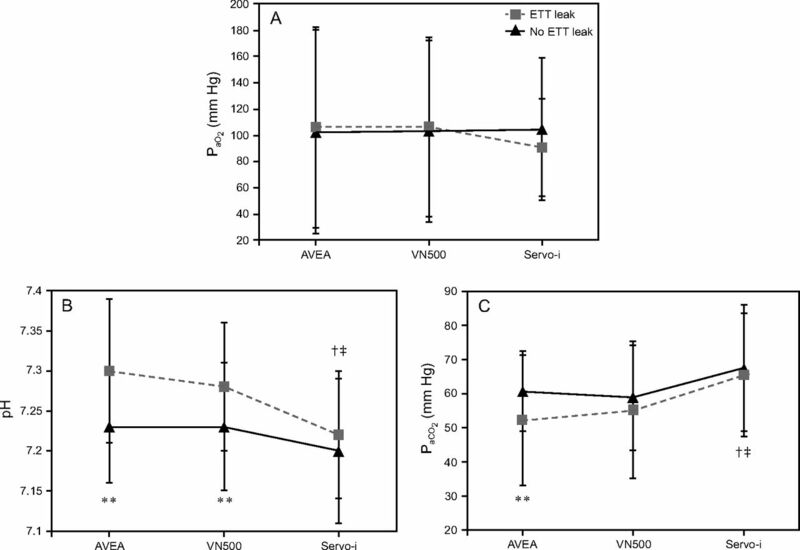 Effect of each ventilator's volume-targeted mode with and without ETT leak on pressure-rate product (A) and percentage of triggered breaths (B). Data are presented as mean ± SD for 45 s of recorded data. Linear-mixed effects model was used to evaluate the association of ventilator and leak status on each continuous outcome variable, with ventilator type and leak status treated as fixed effects; P < .05 was considered significant: †P < .05 between the AVEA and Servo-i within leak and no leak conditions; ‡P < .05 between the Babylog VN500 and Servo-i within leak and no leak conditions; **P < .05 between leak and no leak conditions within the ventilator brand. Airway (upper) and esophageal (lower) pressure (in cm H2O) recorded over a 15-s period in one animal. The arrows represent the efforts being made without a corresponding ventilator-assisted breathe being delivered.